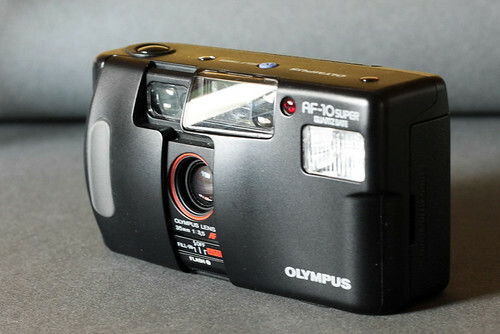 The Olympus AF-10 Super (Infinity Jr. in the US) of 1991 was a fully automatic 35mm compact camera, nicknamed "Picasso Mini Super" in Japan. It was part of the AF series. Auto-load, wind and rewind of DX-coded film. DX decoding in steps 50-100-400-800-1600. Non-DX film treated as ISO 50. Integral flash with "auto," "off" and "fill in" modes. Flash Range: 4.5 m with 100-ASA film and 9 m with 400-ASA film. Power Source: 2 AAA alkaline batteries or CRA123A lithium . AF-10 Super in the official Olympus Global History (archived). 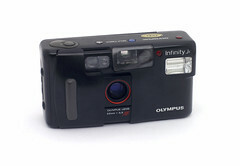 How to Modify the Olympus Infinity Jr. as a remote triggered camera (archived). AF-10 Super on collection-appareils.fr (in French). This page was last edited on 15 December 2017, at 11:43.